“The darkest hour is just before the dawn.” I’m sure you’ve heard and read this all your life. Where did it originate? Apparently, the first to use it in literature was an English theologian in 1650, but he was probably not the first to use it. We see it a lot, especially in self-help books, journals and workshops, also in literature. It’s popular because it’s true. We’ve all worked on something important to us, finally reaching a moment of despair, only to have the answer we’d been searching for suddenly materialize. Or for those of us who have struggled with something in our lives that keeps turning up and blocking us – over and over – until we loose hope of ever turning that around, and then shortly after, we find the answer, and then change happens. The feeling of new discovery after such bleakness is indescribable. Uri Alon in his Ted Talk on Why science demands a leap into the unknown describes what he discovered as a PhD candidate: he was in the middle of writing his thesis, and found that all his assumptions were incorrect, everything he tried led nowhere; he lost all sense of direction, felt unworthy, that he couldn’t be a scientist. He didn’t end up quitting, and eventually made it through with the help of his friends and colleagues, ending up discovered something completely new that proved to be the key point of his thesis. Afterwards he remembered feeling an amazing sense of calmness – the reward for hanging in there and waiting for the magic to happen. Then, a few years later, it happened again – he was working away and getting nowhere, final ready to throw it in, and that’s when he made another new discovery. Then, he began to hear from other researchers that they’d had similar experiences. As it happens, Uri is a man of many talents and passions, and one of these is as an improv actor. If you know about improv, then you know that it’s about getting up on stage with no clue about what’s going to be handed to you; and whatever is handed you, it’s up to you to make something of it, regardless of the consequences. When he was learning to be one, he was told exactly what was going to happen: that he would get on stage, having no idea what would happen, and that he would get stuck and fail miserably! The whole experience was to learn how to be creative in that stuck place. This improv approach is exactly, he realized, what he wanted to nurture in himself, his colleagues and his students. We all assume that if we have a question A – and want to reach the answer – B (whatever that may be), we do our experiments or take action, and eventually – pretty directly – get to B. But in fact, it’s never a straight line to the answer. Instead, we try, fail, try again, and keep going around and around in seemingly endless circles until we are stuck. He calls this the Cloud. We can be lost in this cloud for a short or long period, but one thing is certain – we will end up in that cloud. It’s because this cloud stands at the boundary between the known and the unknown. If we continue to explore the problem inside the cloud, then eventually we might notice something new coming out of the cloud that relates to A, but not to B. This is something we weren’t looking for or expecting -C.
What he came to realize is that in order to discover something truly new, we must change at least one of the basic assumptions we’re making. B is some thing or experience we know something about at the beginning, but C is brand new. Hanging onto our assumptions will drive us around in circles forever. Saying “Yes, and” is a way of changing direction deliberately with hope and curiosity replacing inner resistance and ultimately hopelessness. Sherwin Nuland in his Ted Talk on the extraordinary in ordinary people, talked about hope. He discovered that the concept of hope is based on the Indo-European root – keu – which is the same root that ‘cure’ comes from; and it means going in a different way. Hope is about looking in new directions that we hadn’t previously guessed or expected. Growing, learning something new, discovering new pathways, all require change in us, and change requires changing directions. If you think you know where you’re going, you’re not going in the right direction. The process of change means we will end up in the cloud – that boundary between the known and the unknown, and when we do, we can either approach it in resistance and despair, or in the hopefulness of “Yes, and”. Pema Chödrön might add: Be more like a river than a rock. There is no shame in needing a little prescription help when combating depression. This said, I have noticed more and more clients want to try the non-RX way to battle depression before they have to get a prescription. Below are the 3 ways I have found that help battle depression without having to have a doctor sign-off on a prescription. This said, if you feel like you are in need of RX help, please ask for it. There is no shame in asking and not all options work for all the people all of the time. #1 alternative to RX- Get moving. Exercise can relieve depression, possibly by altering the mood-regulating brain chemicals norepinephrine and serotonin. Aerobic exercise, such as brisk walking on a treadmill, is best, but any degree of exercise is better than none. #2 alternative to RX – More light. During the short, dark days of winter, some people are prone to a type of depression called seasonal affective disorder. One way to ease symptoms may be light therapy, in which you sit near a brightly lit box that mimics outdoor light. The therapy generally starts with daily sessions of about 15 minutes and increases to up to two hours daily. The timing depends upon the severity of symptoms. Basically, start going out in the daylight or ask your doctor about actual light therapy. #3 alternative to RX – Your thoughts. If you know how often you are thinking negative, you can focus on thinking positive thoughts on a more regular basis. Start a diary simply to track your moods, thoughts and the words you use. Yes, therapy focused on teaching people about positive thinking has been shown to relieve depression,so start tracking the bad words, the negative thoughts and then you can focus more on using positive words and thoughts, which may help with the depression. Depression is serious. If you try these things and feel they don’t help, seek alternative treatment or an RX. You need support and clinical supervision is always an option depending on how severe the depression becomes. I was inspired to write this after watching a past episode of Marie TV where she talked about times when we are told our dreams are “too big”. I’ve been a dreamer all my life. This worried my mother, who’s one constant refrain to me was “Come down to Earth!”. I know she was worried I’d be disappointed, but her worry created in me self-doubt. At times, my dreams and expectations are, indeed, unrealistic. Those times always begin with incorrect assumptions on my part that I haven’t verified – often haven’t even considered. For example, as a kid, I spent one full summer turning the clay of the Alberta prairies into bowls and pots, sun baked and water-colored. My brother and I worked in tandem – he spent his days digging tunnels, creating a maze of ‘forts”, and I gladly re-purposed his leftover clay. Unknown to either of us – because we hadn’t considered it – was the inherent crumbliness of clay: his tunnels and forts could only work if confined to a relatively small area, being, in fact, shored up by the rest of the field. We also didn’t consider the hundreds of Prairie Dogs, who habitually dug through constructed clay walls, weakening the structure. So, if you haven’t guessed by now, the entire infrastructure collapsed one day – fortunately with no one inside. And that was the end of that enterprise. A little forethought could have saved us a lot. That was a fun experience, and I remember it that way (kids would not likely have a chance of doing something like that these days). But other more recent ones weren’t fun – like the time I misjudged a contractor because I thought he came recommended but discovered – too late – that the person who referred him had been paid to do so. My focus had been on what I wanted and what I was going to do with it, and it blinded me to the incorrect or incomplete assumptions I made going in, and upon which everything else was based. Those kinds of experiences made me doubt myself – maybe I’d bitten off more than I could chew; maybe I was indeed dreaming too big. But the truth is that I wasn’t dreaming too big; the truth was that I didn’t actually have enough trust in myself, and relied on others when it wasn’t justified. Until I learnt that lesson, I kept spoiling my own dreams. One friend called this jumping in without looking. That’s what I did. That isn’t the only way you can feed self-doubt. Another way is to listen to the nay-sayers that are going to be around whenever you dream big. Frame your dream or expectation. Write it down, because the simple act of writing it down means that you are 40% more likely to achieve it. Fend off negativity. Take responsibility for the energy you allow in your life; often we focus on one negative voice instead of the many positive ones. Allow positive reinforcement, throwing out that one toxic negative voice among the many. The only opinions that matter are from those who know us, who we admire, and who’ve been where we’re going. Flood yourself with positive, inspiring examples. There are so many people who have achieved their dreams, and for most people around them, their dreams were “impossible”. Fast forward. And listen to that elder you’ll become some day. One big regret of people who are on their deathbed is that they didn’t live the life that was true to themselves but instead lived the life others expected of them. Focus on action. The action step is the step that will move you past fear and into your dreams. And I’ll add one more: check your assumptions. Write them down and then verify them. You might save yourself much heartache, and instead ensure the fruition of your dream. Dreaming, especially dreaming big, doesn’t mean you’re head’s in the clouds, but it does mean you need to make sure you can make them real, and for that learning to trust yourself and base your actions on solid ground is essential. Reclaim Your Joy of Living with Informative PDF Download! “The program is free and it is short. Really, it acts as an introduction to my Joy of Living program but without the financial commitment. This is a great way for those who are feeling bogged down by life to start to seek information on how to distress and reclaim their own personal happiness again,” said licensed therapist Maryanne Nicholls, creator of the program and founder of The Joy of Living. A key point of this program is to help people learn how to understand the true you in order to reclaim a sense of purpose, destiny and control over your life. It is a self-guided PDF file that may be safely downloaded simply by inputting an email address for Maryanne’s email list. “There is literally no commitment to have this free program. You can share your email address with me and then opt out of my weekly mailer at any time. You keep the PDF either as a printed document or on your computer forever. It is risk free and there is no test at the end of it. This truly is my gift to help others cope,” finished Maryanne Nicholls. Maryanne Nicholls is a Registered Psychotherapist (RP), Certified Gestalt Therapist (Cert. GIT), and trained in Narrative Therapy, Mindfulness-Based Cognitive Therapy (MBCT), Emotion Freedom Technique – Tapping (EFT), and Trauma & Attachment Psychotherapy. If there are two things that cause us the most trouble and inner anguish in our daily lives, its either getting started or finishing something. We may be someone who has trouble starting, finishing, or both. My father notoriously didn’t finish things – we lived in a house with a half-finished basement, with a back yard that was almost finished. Sometimes, he would actually finish what he started, but only after years of delay, distractions, and becoming blind to it’s presence, and finally getting a real, serious, threatening ultimatum. And part of the reason he never finished anything was because he’d wait till the last minute to begin, work like a demon last minute, wear himself out, finally make some mistake, then stop, get discouraged, and leave it for a very long time, if not forever. I found it endlessly aggravating, so – naturally – that was one thing I vowed I’d never do. 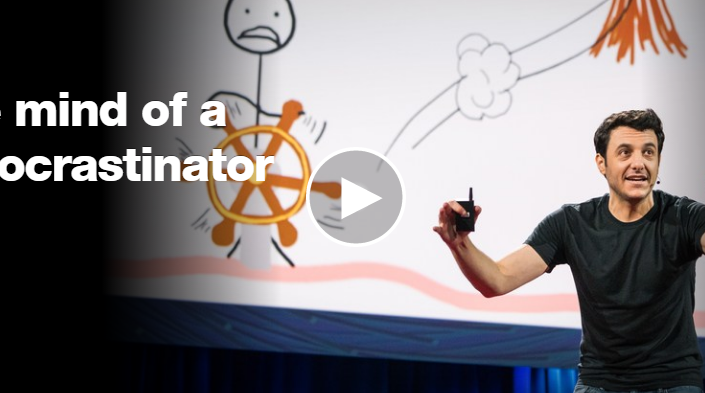 Procrastinators, according to Tim Urban (see the Ted Talk below), have a really hard time doing anything that has long-term benefits if it doesn’t also have the short-term benefit of instant gratification. When faced with work that looks scary and labor-intensive, the procrastinator will almost always go for relief into something that gives them a momentary pleasure. He calls the place procrastinators go The Dark Playground. The only way procrastinators seem to be able to get going, get started, and then finish, is if a deadline is looming and panic sets in. This is a problem, and shortens lives eventually. But what’s even worse is when there is no deadline, because then even if things get started, they rarely get finished. Unfinished and unstarted things begin to pile up, resulting for the procrastinator in frustration, depression, and feeling like they are merely spectators in their own lives. Marie Forleo discusses this problem for those of us who are self-starters in our own businesses. As self-starters, procrastination will kill whatever it is we are striving for faster than pretty much anything else. Deadlines don’t work because there’s too much riding on them – if anything is delayed or ignored, it’s likely going to stop everything, leading to missed obligations, broken promises and lost opportunities. Her answer? Start before you’re ready. If you’re a procrastinator, you might delay starting because you don’t feel you’re ready, or that you need to get it right. This need isn’t actually real, because in truth, we are never really ready to start something and be sure we won’t miss something or make it perfect the first time. We all learn by trial and error, and that means the first time we do something is really necessary and unavoidable practice for the next time we do it again. If you never get started on the fist iteration, you’ll never get to perfection. So the next time you’re faced with something that feels daunting, and begin to feel the tug of instant gratification, make a deal with that part of you who would rather play – satisfy him or her in some way – then get to it. Start before you’re ready! One thing I hear daily in my practice is that people feel like failures; they feel deflated and disheartened that their efforts to find a better way of living don’t seem to be making life easier or better. They find themselves falling into familiar patterns that they know don’t work. I’ve been there too, in both my business and personal life: I’ve made mistakes, losing relationships and opportunities. When that happens, it hurts and its hard for me to stay positive. Cherly Strayed talks about the importance of failure for personal growth in her book Brave Enough. She believes that our failures contribute to our successes because they teach us to be humble. In fact, she believes that being humble is the key. Confucius called humility the foundation of all other virtues. Humility equates to modesty. It can be a negative value if we don’t think much of ourselves – then it isn’t really humility we feel, but self-hatred; it can also be a powerfully positive value that makes it possible for us to see ourselves as we truly are, because when we’re humble, we don’t fear the truth. Huffington Post describes 7 habits of the truly humble. Because the truly humble are free of pretense, their focus is on others in a truly compassionate way; they tend to have a realistic view of themselves and others, and as a result do not have unrealistic expectations that are doomed to failure and disappointment. Hence, they have a positive outlook on life, and build strong relationships with others. And so, when Cheryl Strayed says she believes that humility is the key, she includes learning from failure. Failure is about learning the hard way, and sometimes, especially if we venture into unknown territory, this is the only way to learn and grow. Sometimes we do drive down dead-end roads in life, but that doesn’t mean we get stuck there. And when we turn around and get back to the fork in the road where we first got off track, we come with the knowledge of what doesn’t work, eliminating at least one possibility and saving ourselves much grief the next time around. Her mother called this “Putting yourself in the way of beauty”. We can choose to either focus on our disappointments, or on what’s beautiful. We can focus on our imperfections, or on what we learned.